MVRDV and The Why Factory stage a series of interventions for the Seventh Bi-City Biennale of Urbanism\Architecture (Shenzhen) (UABB) jointly curated by curator and critic, Hou Hanrou and founding partners of URBANUS, Liu Xiaodu and Meng Ya. On August 1st the successful Vertical Village exhibition will open in Hamburg Museum as part of the IBA Hamburg programme. The show, by MVRDV, the Why Factory and three artists/architects from Taiwan, was previously on display in Taipei and Seoul and now makes a first stop in Europe having been totally redesigned for Hamburg: a port city closely tied to Asia, and an ideal environment to discuss alternative modes of urban development to the relentless ‘Block Attack’. The show is open to the public between August 2nd and September 29th and features a walk through the Vertical Village urban regeneration proposals, films, software, and a giant, interactive Vertical Village sculpture made of more than 80 pieces of urban furniture. August 2nd, an international symposium on Taipei will take place. By invitation of Director David Chipperfield, MVRDV and The Why Factory contribute to the 13th International Architecture Exhibition, entitled Common Ground. The main contribution consists of the collaborative project ‘Freeland’ forming part of the single exhibition in the Central Pavilion at the Giardini. Further contribution is made by Winy Maas and The Why Factory with ‘Porous City’ to the EU CITY Program, initiated by the European Forum for Architectural Policies (EFAP) representing Europe for the first time at the Venice Architecture Biennale. Presented as an animated documentary on a multi-screen surround projection, Freeland explores the prospects of complete liberation of urban planning. It questions whether classical centralized planning is still needed in times of increased individualization and if instead a self-organized city can be imagined. What can be organized individually and when will we need our neighbours? What are the “minimal common grounds” of our developments? Freeland is rooted in two projects: it combines the practical side of the development strategy designed by MVRDV for Almere Oosterwold with the research on bottom up urbanism addressed by the AnarCity studio led by The Why Factory at TU Delft and the Berlage Institute. MVRDV’s Almere Oosterwold is a revolutionary model in urban planning as it steps away from governmental dictate and invites organic urban growth, stimulating initiatives by which inhabitants can create their own neighbourhoods including public green, energy supply, water management, waste management, urban agriculture and infrastructure. The Why Factory’s AnarCity unveils utopian scenarios that fantasize on radical liberated urbanization in different situations and contexts such as the fall of government, climate crises or voluntary anarchism. The movie takes the viewer on a time-travel back to the utopian Freeland. Successes, failures and surprises play out in a series of intriguing narratives. Besides the main contribution ‘Freeland’, Winy Maas and The Why Factory are involved in additional programs and events of the 13th International Architecture Exhibition at various locations. At Spazio Punch at Guidecca ‘Porous City’, an exhibition of 676 LEGO towers at a scale of 1:000 will be on display at the launch of the EU CITY Program, a manifestation representing Europe for the first time at the Venice Architecture Biennale. The EU CITY Program, initiated by the European Forum for Architectural Policies (EFAP), advocates the importance of architecture as a common ground for European cultural expression. EFAP is concerned with the urgency for architecture, urban design and creative industries to be part of the European Union policies and starts a discourse through the EU CITY Program about how the European Union can evolve the frameworks of city making towards cities that meet our needs. Furthermore Winy Maas has been appointed advisor for the first ever Kosovo entry, and The Why Factory will present the AnarCity movie by the Berlage Institute and launch two books. ‘Freeland’ is a collaborative project by MVRDV and The Why Factory and was made possible by the financial support of the City of Almere. Rotterdam based SYNPLE made the animation. The ‘Porous City’ showcase has been generously supported by the LEGO Group, Denmark. The Exhibition Common Ground in the Central Pavilion at the Giardini and the Arsenale will present 63 projects by architects, artists, photographers, critics and scholars who have involved other colleagues in their projects with whom they share a Common Ground, making it a total of 110 participants. The launch of the EU City program will take place on Monday, 27 August at the central venue of the Architecture Biennale. The exhibition Porous City will be opened on Sunday, 26 August at 18.00 at the Spazio Punch, Giudecca 800/o, Venezia 30133, Italia. The 13th International Architecture Exhibition will be open to the public from 29th of August through 25th of November 2012 with previews on 27th and 28th of August. Today MVRDV, The Why Factory and the JUT Foundation for Arts and Architecture opened the fourth edition of the exhibition series “Museum of Tomorrow” in Taipei. Under the title “The Vertical Village” the exhibition explores the rapid urban transformation in East Asia, the qualities of urban villages and the potential to realize this in a much denser, vertical way as a radical alternative to the identical block architecture with standard apartments and its consequences for the city. The exhibition consists of analytical research, a grid of models, various movies, a documentary and animations, two software packages and a 6 meter tall installation of a possible Vertical Village developed by MVRDV and The Why Factory. Visitors can design their ideal house and compose their own Vertical Village with parametric software. The exhibition is located in Chung Shan Creative Hub, Taipei and open from 8th of October to 8th of January 2012. The pressure on the East Asian cities has lead to an increasing urbanization and densification during the last decades. It has made way for the construction of giant buildings, mostly towers, blocks and slabs. A ‘Block Attack’ that gradually replaces and scrapes away the more traditional low rise, small scale, often ‘lighter’ types of architecture and urbanism: the Hutong in Beijing, the small wooden houses in Tokyo, the villages in Singapore, the individual houses in Taipei and other East Asian cities. These urban villages form mostly intense and socially highly connected communities, with enormous individual identities and differentiations. One can speak of urban ecologies, communities that have evolved over the course of centuries. Their faceless replacements packed with identical apartment units offer a Western standard of living at an affordable price, but at the expense of differentiation, flexibility and individual expression. Is there an alternative to this process? Can one imagine a new model for the development of East Asian cities? Can these areas be densified in such a way that the qualities of the traditional village are preserved? 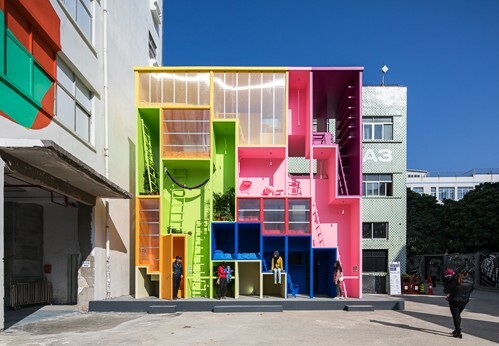 The exhibition offers an alternative, a contemporary Vertical Village – a three-dimensional community that brings personal freedom, diversity, flexibility and neighbourhood life back into East Asian – and maybe even Western – cities. In the fourth edition of the Museum of Tomorrow, MVRDV and The Why Factory analyse, explore and deepen this vision, with the help of the Berlage Institute and many other contributors. The exhibition located in Chung Shan Creative Hub, Taipei, features a 6 meter tall installation and a variety of analytical models and research elements. Visitors will be able to design their ideal house with an interactive platform, “The House Maker”, and develop their Vertical Village with parametric software – a Grasshopper scripted Rhinoceros model, developed by MVRDV and The Why Factory. JUT Foundation for Arts and Architecture publishes the Chinese edition of ‘the Vertical Village catalogue. NAi Publishers is publisher of the English language version which will be published January 16th 2012. The 528 page volume contains the ample research made comprehensible with countless colour illustrations. It features detailed case studies for Tokyo, Beijing, Shanghai, Taipei, Djakarta, Seoul and Bangkok, interviews with among others Winy Maas, Alfredo Brillemburg and Hubert Klumpner, Lieven De Cauter, Peter Trummer and families living in Taipei. The exhibition and publication has been made possible with the generous support of JUT Foundation for Arts and Architecture, Delft University of Technology, The Why Foundation and the Netherlands Architecture Funds. The Why Factory is a global think-tank and research institute, run by MVRDV and Delft University of Technology and led by professor Winy Maas. The Why Factory’s Future Cities research program explores possibilities for the development of our cities by focussing on the production of models and visualizations for cities of the future. The results of this research programme are being presented in a series of books – the Future Cities Series – published in association with NAI Publishers in Rotterdam, edited by Jennifer Sigler, and designed by Bas de Wolff of Thonik / Beng! in Amsterdam. The Vertical Village is the fourth publication in this series after Visionary Cities (2009), The Green Dream (2010) and The Why Factor(y) & The Future City (2010). The JUT Foundation for Arts and Architecture was formed in 2007. Its intent is to use diverse architectural, artistic and cultural perspectives to create better living spaces. Its outreach extends from small minority areas to larger communal ones, for the purpose of establishing ideal built environments. By using knowledge and resources from the field of architecture, and integrating multifaceted views from architects, designers, artists and cultural workers, the foundation is devoted to raising awareness about the concerns and developments of city environments, and to the empowerment of the artistic and creative industries. Events such as exhibitions, competitions, seminars and publications build vivid relationships between art and city dwellers, provoking ideas on living aesthetics and nourishing local art and culture. Through architecture-based projects, JUT has created a stage for artistic movements. Since its founding, the JUT Foundation has organized activities such the ‘Museum of Tomorrow’ exhibition series and international architecture forums and lectures. In 2009, the foundation began to display animations, movies and installations, in order to seek new perspectives on architecture in Taiwan (Alternative Architecture). The year 2010 marked the launch of ‘Project Urbancore’, a project that places art in unused spaces, providing local artistic perspectives and a source of energy for urban regeneration. The Museum of Tomorrow project began in 2007 as an engagement with unused land or buildings that lay idle, at a time of transition from old to new. What will be the most ideal plot in the future? The JUT Foundation sees the ‘Museum of Tomorrow’ as a stage to practice ideas for future city aesthetics. The concept ‘nomad museum’ reflects the rapidly changing character of the city, using the city as its stage. Observations and interpretations are given by experts from different fields – from art and architecture to design – to help city dwellers understand different contexts, and to extend the spirit of place. The ‘Museum of Tomorrow’ has an inherent difference from traditional museums and art museums. It is a ‘formless’ stage that uses no fixed time, location or definition. Performance activities with different scales and themes happen in every corner of the city, bringing about interpretation between people and environment, new and old, tradition and future, private and public. The museum has various kinds of exhibitions in accordance with nomad sites in the city, with organic performances of architecture, art and culture, combining the virtual and the tangible, the active and the static, the two-dimensional and the three-dimensional. The Museum of Tomorrow creates a variety of possible impulses that allow us to imagine tomorrow today. Beyond these variations, the museum aims to create the purest spirit for our time. There is always a better tomorrow. November 24, 2017 in Architects.